PennsylvAsia: "Practicing Ambivalence: Taiko, White Women, and Asian American Performance," April 4 at Pitt. "Practicing Ambivalence: Taiko, White Women, and Asian American Performance," April 4 at Pitt. 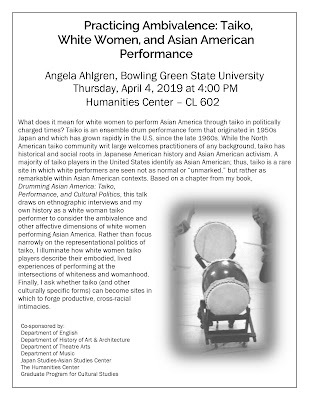 The University of Pittsburgh's Humanities Center will host Dr. Angela Ahlgren and her talk "Practicing Ambivalence: Taiko, White Women, and Asian American Performance" on April 4. What does it mean for white women to perform Asian America through taiko in politically charged times? Taiko is an ensemble drum performance form that originated in 1950s Japan and which has grown rapidly in the U.S. since the late 1960s. While the North American taiko community writ large welcomes practitioners of any background, taiko has historical and social roots in Japanese American history and Asian American activism. 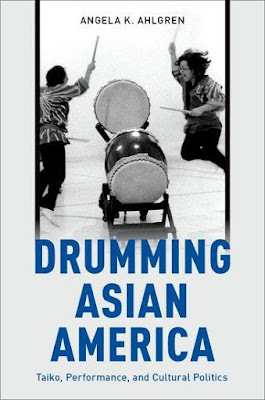 A majority of taiko players in the United States identify as Asian American; thus, taiko is a rare site in which white performers are seen not as normal or “unmarked,” but rather as remarkable within Asian American contexts. 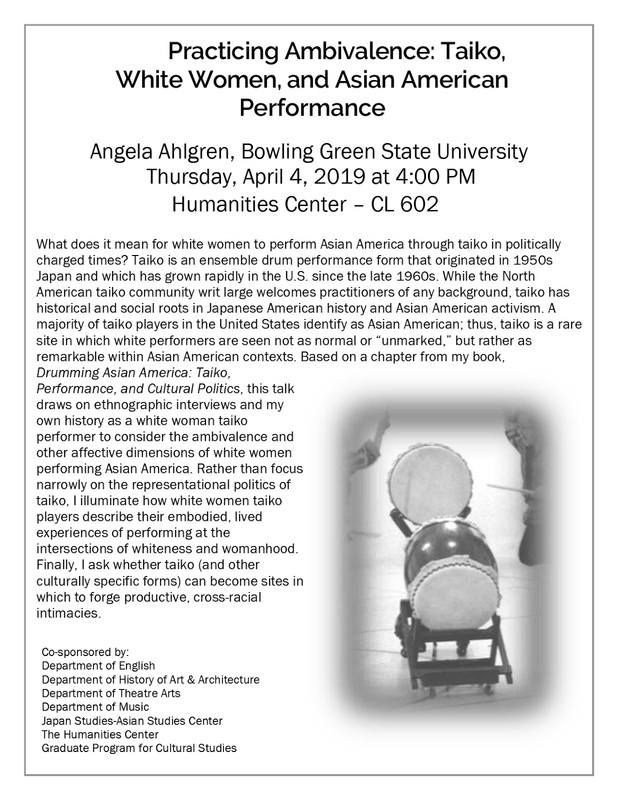 Based on a chapter from my book, Drumming Asian America: Taiko, Performance, and Cultural Politics, this talk draws on ethnographic interviews and my own history as a white woman taiko performer to consider the ambivalence and other affective dimensions of white women performing Asian America. Rather than focus narrowly on the representational politics of taiko, I illuminate how white women taiko players describe their embodied, lived experiences of performing at the intersections of whiteness and womanhood. Finally, I ask whether taiko (and other culturally specific forms) can become sites in which to forge productive, cross-racial intimacies. The talk starts at 4:00 pm in 602 Cathedral of Learning (map) and is free and open to the public.